Tonight is the opening for my new show at the Kada Gallery. The piece above, The Night Run, is part of the show and a piece that really connected with me as I was painting it. Part of that connection comes from the juxtaposition of color and contrast in it and the visceral response those elements bring in myself. 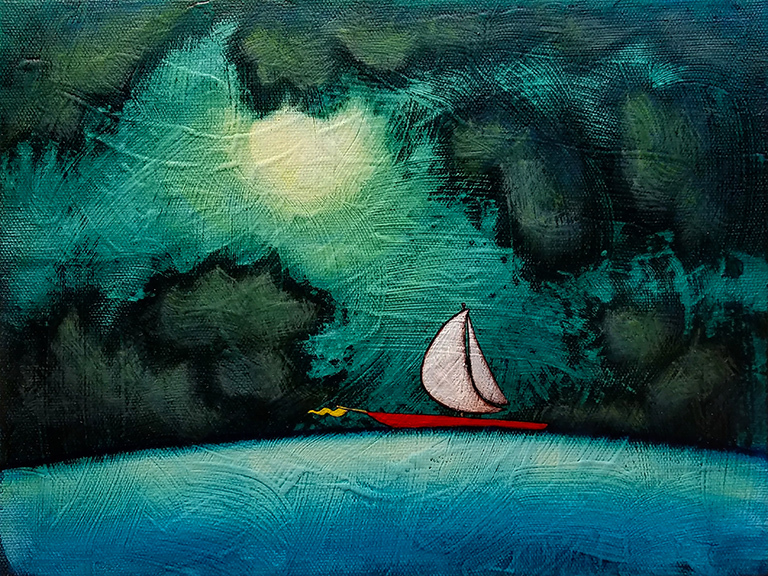 But part , perhaps the biggest part, of this connection comes from the symbolism of the sailboat cutting through waves and darkness, trying to find a suitable place to land guided by a source of light that often is obscured or disappears completely. But when this light breaks through, the destination becomes clear and apparent. The journey takes on a purpose. That is a fitting metaphor for how I see my life as a painter. There are many days when it seems that I am sailing in total darkness and have no idea where I am headed or if I am even moving in any direction at all. I feel small and at the mercy of the deepness of the dark and the power of the waves that push against me. But on better days, when the light breaks through, I feel strengthened and my sails fill, sending me gliding ahead. It’s so easy and refreshing then and I feel strong, vital. The journey seems to have purpose at that instant. That speaks my experience but I think it also applies to many of us in all walks of life. I believe very few of us feel as though we are sailing in clear skies and on calm seas on most days. Most of us don’t even have a destination plotted out. Now, the hard part is at something like an opening when the painting is right there saying all these things and I am standing there, alongside it. These are inner feelings and it’s not always easy speaking to these in a public setting, not knowing sometimes who you are speaking with or if they simply like the colors. Or boats. But I try to gauge their connection and if they seem truly interested and ask, I will tell them what the work means to me, letting them know that to me they are more than mere scenes made from paint smeared on a surface. No, I view them as a vital part of my journey, a log of where I have been and where I am going. So, that’s what I am doing this morning before I head out for tonight’s opening– readying myself to speak about such things on whatever level might be needed. Hope to see you tonight at the Kada Gallery. The opening reception for the show, Sensing the Unseen, runs from 6-9 PM. The show hangs in the gallery until January 3, 2018. I went over to the gallery’s page and noticed that “Call the Light” has the same sort of clouds. I like them, very much. It was interesting to see the mix of paintings that have been hung for the show all on one page. I suspect there will be something for everyone at opening, and that it will be a good night.